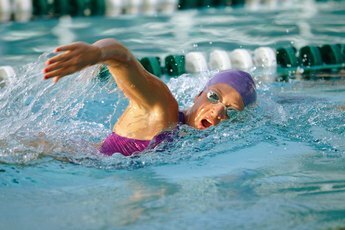 Aquatic exercise minimizes pressure on the body during movement. Pool workouts provide gentle exercise without the same force on the back as land exercise can have. In addition, you get gentle resistance from the water to help you gain strength. A 2009 study in the journal “Spine” found that exercises in water better improved the quality of life of people with lower-back pain than exercises on land. A very simple pool exercise for the lower back is walking in the water. Start with water up to your waist and work toward higher water levels. Simply walk around the pool and swing your arms. Try to use your whole foot while walking and keep your body straight up instead of leaning forward. You can also work up to jogging in the water. "Fitness" magazine offers a “Wave Maker” exercise that works out the back and the abs, which support the lower back. To perform this exercise, use one hand to hold the pool’s edge and the other hand to hold the pool wall beneath the water. Bring the rest of your body up so it’s almost parallel with the water line. Then, kick in the water with your legs and knees pressed together and kicking together like a dolphin. Continue for 30 seconds. Try leg aquatic exercises from The Healthy Back Institute to help your lower back. Stand straight with your feet on the bottom of the pool. Bring your legs about shoulder-width apart and bring one knee up to hip level and then lower it. Switch back and forth between legs, doing about 30 total. Then, bring one leg up to the side. Hold it there for up to 20 seconds, using raised arms for balance, and then lower it. Switch sides. Simply swimming and performing general exercise in the pool can be beneficial to your back. The Aquatic Exercise Association explains that water takes a large amount of impact and pressure off your back. In addition, water exercises have many benefits for the back. They strengthen the back muscles and ab muscles, which support the back. The water’s buoyancy makes any exercise have less of an impact on the joints. Finally, water exercise provides a combination of strength training, stretching and aerobic exercise, which are all beneficial for the health of the lower back. The Healthy Back Institute: Relieve Lower Back Pain with These Pool Exercises!